A Year in Search: How Many Google Searches per Day? Twenty years ago, Google transformed itself from a small company operating out of a garage into a business empire. Over the past two decades, the tech giant has developed many ventures: a smartphone operating system, robot assistants, a language translation service, and video-conferencing software, to name a few. However, Google’s core business, the online search engine, remains the company’s most valuable brand. The unstoppable evolution of the search engine has established Google as an industry leader. What served only ten thousand search queries per day back in 1998 surpassed 3.3 billion daily searches in 2012. If you check how many Google searches per day take place now, I bet the numbers will surprise you even more. As of June 2018, 55.1% of the world’s population had internet access, and the number of searches per day significantly favors Google. Google holds 92.21% of the overall search engine market share and remains a leader in its own game. First of all, Google is where the users are, and Google does everything they can to ensure users have a seamless experience, which positively impacts the number of Google searches. Not to mention, Google’s algorithm is complex, and it’s updated approximately 500 times a year to ensure users get the most relevant results. The industry leader also has an incredibly rich set of results. Google “SEO” and you’ll get 833,000,000 results! In comparison, if you search the same query on Bing, you will only get 16,800,000 results. Finally, Google has a simpler and cleaner interface compared to other search engines. There aren’t UI banner ads and other distractions—the focus is solely on the search query. Google operates at an insane level that can hardly be matched by any competitor. Before we dive into the numbers for the past year, let’s take a trip down memory lane. At the beginning of the new century, the average number of daily searches was reported to be 18 million. This number jumped to 60 million Google searches per day in the second half of 2000. Google’s Zeitgeist reported 150 million queries per day in 2001. But this figure skyrocketed to 200 million daily searches in 2004. Five years later, Google proudly announced they were handling over 1 billion searches per day. 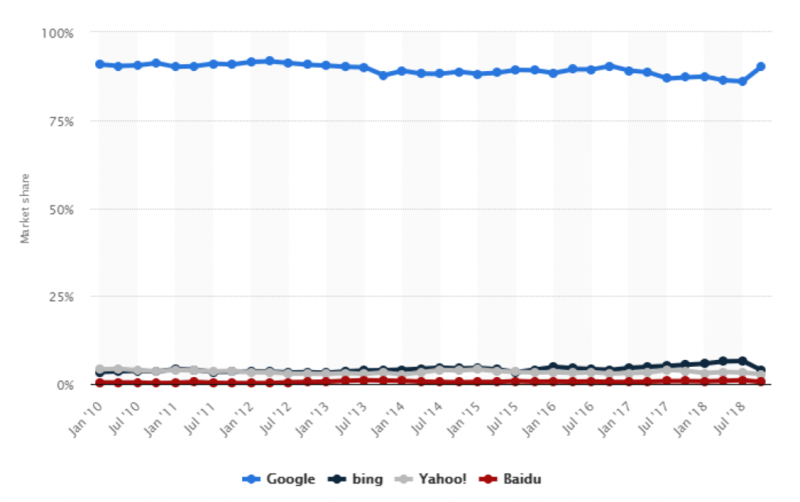 During the 2010–2011 period, the search leader remained silent as to the number of searches. The radio silence was broken in 2012 when it was estimated that there were 1.2 trillion Google searches per year. This figure translates to 3.2 billion searches per day. Google grew with tremendous speed, reaching 2 trillion searches per year in 2016, which equals approximately 5.4 billion daily searches. So one thing is certain—2018’s number of Google searches per year has surpassed the 2 trillion mark. To break this down, the leading search engine processed 10.34 billion explicit core search queries in October 2018, according to Statista. That’s 63.2% of the total US desktop market. Google also accounted for 88.6% of the mobile search market in the United States. If we take this number as an average for every month in 2018, we can easily do the math: 10,340,000,000 monthly searches translate to an average of 344,666,666 explicit core Google searches per day. Note: These are not official numbers. We took it upon ourselves to do the math based on the stats and facts provided by credible sources. On the other hand, Internet Live Stats’ live map claims there is an average of 5.8 billion total daily searches on Google. If we break down this number further, we would see that there are 71,780 Google searches per second. How Many Google Searches Does the Average Person Make? What we know for sure is that Google processes more than 2 trillion searches every year. We’ve done our math and discovered that an average person conducts 3–4 searches every single day. This translates to approximately 1,200 monthly searches. Also, the average time a user spends searching for something on Google is less than one minute. The answer to this question is just one click away on google.com/history. 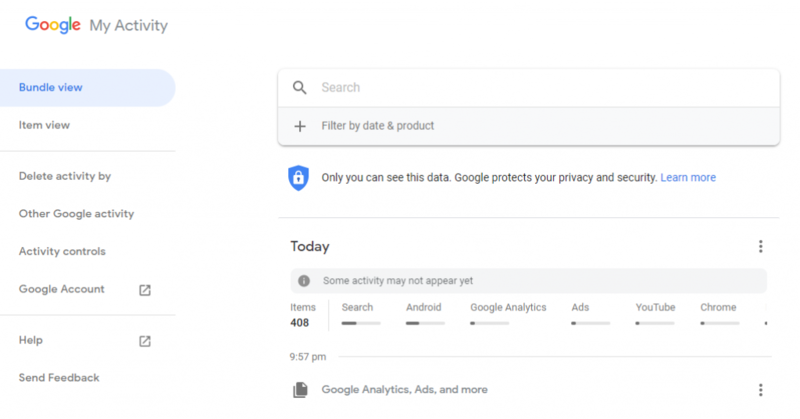 On top of being able to see every single search you’ve ever made, along with the exact date and time they were made, you can filter your browsing history by the medium you’ve used. You can even go back to see the very first thing you Googled! Google holds 92.21% of the overall search engine market share. Google reached 2 trillion yearly searches in 2016. As of October 2018, Google processed 10.34 billion explicit core search queries. So how many Google searches per day? There are 5.8 billion total daily searches on average or 71,780 searches per second. 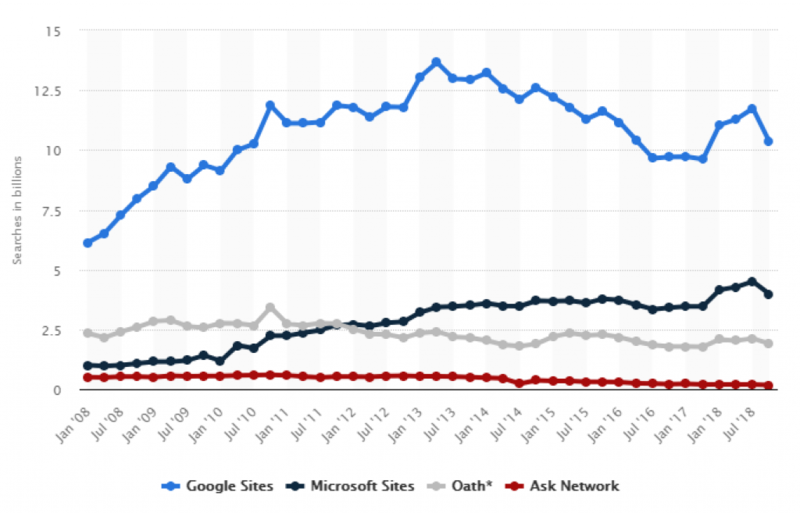 These numbers change constantly, but one thing remains certain—Google is the indisputable industry leader. However, digital marketing is a changing industry, so even with this data in mind, it’s best not to ignore the other search engines.